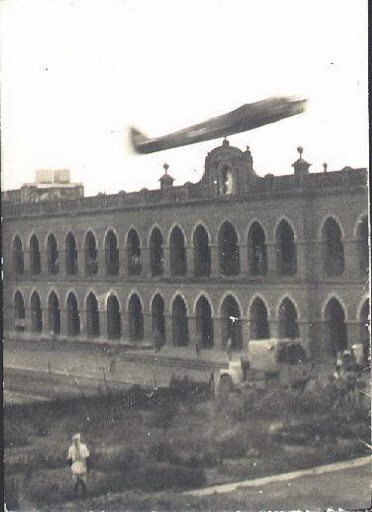 From Calcutta the squadron moved to Fyzabad, then shortly after to Asansol where retraining was started on 31st. March 1942 under new CO, W/Cdr. Grey. Most of the squadron had made it out of Burma and rejoined the squadron by this time, Corp Glyn Edwards describes his arrival on March 27, 1942: "We were taken in trucks to the airfield this morning via the 'town' of Asansol; a one-eyed hole which really amounts to a village, and a rather dusty one at that. The place is approximately eighty miles North of Calcutta, and 'Cal' is the nearest major town to us ! The place where '113' were billeted on arrival was LORETTO CONVENT, where we stayed for several weeks until moving to a newly-built billet a couple of miles away from the airfield. The main dirt street of bazaars reminds me very much of Magwe. but we have been given the names of certain shops and cafes, where food is fit for 'English Sahibs'. There is one tin-shack cinema here and they are going to show English speaking films, which suppose is good news. Our billet is situated a half mile from the road, access to it by cart track and no lighting to show one the way home during the hours of darkness." The Squadron was able to recommence operations as early as 12th. April. These were mostly against Japanese army concentrations, airfields and lines of communication, the latter sometimes being `bullock trains', a target which must have given `pause for thought' to some of the crews. In early April 1942, and although it is not well known, the 113 Squadron also added China to its extraordinary and growing list of operational theaters. It was also to be another theater of tragedy whereby one aircrew member would find himself walking home and others never to return. While the actual involvement of the squadron's aircrew in China was limited to a brief period flying raids out of Loiwing, for those members sent to China by ground transport, led by Dr. LaFrenais, it would become a long horrific nightmare from which many would not return. This new RAF presence in China was to be called RAF China Wing., and clearly the primary motivation behind this new wing was political rather than strategic. ie: stalling for time and to boost Chinese moral. The support staff and ground crews for RAF China Wing, was largely headed up by the Squadron doctor, Dr. LaFrenais who, from Lashio, made his way to Loiwing "presumably" to join the aircrews. In the meantime however, the Squadron detachments of aircraft had already left and returned to Assansol. It is unknown if the Squadron's aircraft were ever intended to remain in Loiwing, but here Dr LaFrenais was ordered to assemble over 300 officers and men which were to be the Ground and Support Crews for the RAF China Wing. After picking the finest from every trade the RAF had to offer, in good faith he and his group set out for Chengtu China to establish forward bases. It was to end up being a study in human perserverance against all odds and after months of unimaginable hell were never to see the promised aircraft. It is doubtfull any were actually intended, and if there were, it likely ended when the 113 Squadron detachments were ordered back to Assansol. Sgt John Reid was on this detachment to China and was in formation with F/O Hickey when he crashed: "We were sent to Loiwing from the (16/04/1942)16th of April 1942 untill the 20th (20/04/1942). On the 16th we flew out from Asansol to Lechim (sp? ), Kelewa, Bhamo to Loiwing. On the same day we flew down to Lashio which was in the Northern Chin States south of Loiwing, the weather was bad however and we returned to Loiwing. Lashio was an RAF base and we got all our bombs here. On the 17th we flew back to Lashio and stayed overnight. On the following morning of the 18th we did an operation from Lashio to Magwe, Here we straffed and bombed the town and aerodrome while the AVG (American Volunteer Group) provided top cover, then returning to Lashio then back to Loiwing. On the 19th we flew out to Lashio then on to Allenmyo where we straffed and bombed with only two of us returning afterward to Lashio then back to Loiwing. The flight consisted of P/O Max Hickey, F/O Eric Pearse and myself., P/O Hickey was lost on this operation enroute to Allenmyo. There were the three of us in formation flying very low down the dry bed of a river aways then we swung left up out of the river bed over the bank and as we came up there were palm trees, pagodas, and such we had to lift up over. Banking into the turn I was highest up on the outside, F/O Pearse leading was in the middle, and P/O Max Hickey was lowest on the inside. Although watching the leader, I happened to catch Hickey's plane for an instant out of the corner of my eye and thought his left wing tip was bloody close to those palm trees and Padgoda's, then I saw it dip and it was gone from my field of vision. At the time there were Japanese troops on the road and we were taking ground fire from the area and whether he got hit by ground fire, or hit the top of a padgoda or tree I can't say. When we got back my Wop/Ag Sgt Lenny White said "yes I saw him go in, there was a huge cloud of dust, no sign of flame or explosion, just a pile of dust"
The entire crew was lost and F/Sgt Max Hickey Pilot, F/Sgt Edgar Campbell Obs and F/O Ron Llewellyn Rogers Wop/Ag were reported missing presumed dead. Sadly the crew of F/O Eric Pearse Pilot, F/O Colin Grigg Obs and F/Sgt Joe Germein Wop/Ag, although having safely returned to Asansol after this raid were to be all killed when their aircraft was lost in a storm barely a month later on 23/05/1942. F/Sgt Alan Bailes was one of those dispatched on the 21st of April and gives us a detailed account: "six Blenheims of No 113, led by the CO, W/C Grey, left Asansol on detachment to Loiwing in China, calling at Lashio en route. Loiwing was at that time the base for the AVG flying Tomahawks with Chinese insignia, with the air intake painted to look like shark's teeth. On the 24th of April, two crews, F/O Hammond' s and our own were briefed by G/C Noel Singer at Lashio, to make a low level attack on a Japanese armoured column advancing towards our base. They were about 100 miles due South on the Hopong-Lohlien road. We were carrying 4 x 250 with rod extensions and 11 seconds delay fuses. Nearing the target, I noticed with alarm that Hammond's aircraft had pulled well ahead of us. As we attacked the column I was strafing from the turret when there was an orange explosion to starboard. As we climbed I saw grey smoke coming from our starboard engine. I reported this to F/Sgt BiII Hinds and a few minutes later he ordered me to bail out. I last saw my aircraft maintaining altitude with one engine on fire. I think we had been hit by fragments of Hammond's bombs, as the rod extensions were designed to explode the bombs at ground level. The 11 seconds delay would be about the right interval of time between ourselves and Hammond. I walked north for three days using the sun as a compass and got back to Lashio where I flew as a passenger with F/O Hammond to Loiwing and then back to Dum Dum and from there back to Asansol. Nothing was ever heard of my crew again." Observer F/S John Aitken and pilot F/Sgt Bill Hinds were later reported missing presumed dead. On a lighter note, one of the more famous incidents on the squadron, well known to many, and each having different versions, occurred on May 12, 1942. This entry from Corp Glyn Edwards diary, recorded at the time is likely closest to the truth: "A little excitement at the billet today although the outcome could have been disastrous. 'Tex', (Flt/Sgt Mike ffolliett Foster) one of our pilots, decided to shoot-up the building on his way back to the airfield, and after one or two 'show-offs' for men at the billet, he misjudged the height and caught the brick-cross on top of the building; the plane veered off as bricks came tumbling down .. a lucky escape for all ! Pilot, Sgt John Reid also witnessed this event and was standing on the balcony watching and noted the falling mortar and derbis from the cross caused those watching from below to scramble out of the way. this picture not looking up, something is fishy about it. A sensational shot! The boys beating up the school again! This may or may not be F/Sgt Foster. Note the chaps hanging out the window. Another incident, only this one had tragic consequences, took place on June 10th (date not verified) and is again extracted from the memoirs of Corp Glyn Edwards: "After duties today, several of us jumped off the truck before reaching the billet, in order to have a refreshing 'dip' in the murky pond. Little did we know the tragedy which was about to take place. One of the airmen who had only recently joined the squadron on arriving straight from England, failed to surface after diving from a tree which we used as a diving board. Following numerous attempts to find him, he was eventually released from a thick cluster of weeds, at the bottom of the deep pond. Nearly an hour of artificial respiration by some of us and then a doctor, failed to revive the poor fellow, who was apparently married shortly before leaving England. His blue and puffed-out face with foam running from his mouth, will be a scene I will never forget. The funeral is to take place tomorrow morning.11th June, A break for the burial of our colleague, and then back to usual duties ... a very sad day ! This evening, some of us went into town and had a drink at Madaths; passing the pond on our return, the usual noise of croaking frogs was heard ... they always take over the water at night ! Pilot Sgt. John Reid recalls the valley trap which caught Butcher: "I saw that blind valley that caused Butcher to belly land on the slope. The Japs were causing problems to the UK troops at Fort White. On 07/07/1942 operating from Tezpur, we were briefed to do a bombing raid (single aircraft) on Kalemyo and then do an offensive low level recco with strafing of the Kalewa Road and then the road to Fort White, situated in the foothills of the main range. As we turned around a bend in the road there was an inviting valley with the same road in the distance climbing to Fort White. Peter Wilson (Obs) shouted “Watch it, its too narrow”. I also could see the danger so we turned tail and got out of it before returning to Tezpur. We reported this trap on de-briefing and I cannot help but wonder if it was passed on to Butcher, who got trapped in the same valley the next day, 8/7/42. It could have been so easy to get into an impossible situation with the steep ridges on either side of the valley preventing even a steep turn to get out, the rising ground ahead being too high to climb over even on full throttle". CO, W/Cdr. Walter took over the squadron on 31st. July 1942 and shortly after his arrival a further task was given to 113, quite outside anything it had been involved in previously, which was to support the Civil Authority. As the Operations Record Book entry for 14th. August puts it: `Because of rioting and incendiarism among the people of India, internal security patrols were started'. This sort of aerial policing probably didn't go down well with operational air crew and no doubt they were even more upset when, on 20th. August, one of a two aircraft patrol on such work, piloted by F/Sgt. Goss, failed to return and, again quoting the Record Book: `when the aircraft was found it was discovered that Goss had been killed in the crash but the navigator and Air Gunner were murdered by the local inhabitants'. These were not the only British and Commonwealth servicemen to meet such a fate in a country seething to be free of the `Imperial Yoke', and 113 was to suffer one other such loss when their last adjutant, F/Lt. Mooney, DFC DFM, was murdered in Calcutta in late 1945, having survived two operational tours in Bomber Command as a Flight Engineer, before being grounded and transferred to administrative duties. Sgt John Reid also took part in these civilian patrols: I flew a 2 aircraft “Internal Security Patrol” (we called them WOG Reccos) in company with S/Ldr Penny who was an excellent pilot and leader. We swooped on Congress mobs who were burning and looting railway stations. When we fired red verey flares they dispersed very quickly. Muller-Rowland of 60 Sqdn hit a railway signal post one day and knocked off about 6 feet of wing as far as the landing light and returned to Asansol. When I asked him how the aircraft had handled he said “Just a little bit wing low”! The entry for the 26th of August from Corp Glyn Edwards diary gives us a look at how those on the squadron felt about India's social unrest: What a hell of a month has it been in this country; we have been stoned and spat at, and a truck full of lads from our squadron have been rushed to Calcutta to help quell riots there. Gandhi and some of his fellow Congress leaders have been put in jail, for their own sakes as well as ours ! A great number of trains have been derailed, and with many Indian passengers killed or injured, it is mainly their own country folk who are suffering most by this carefully planned and senseless destruction. Many railway stations have suffered dreadfully from mob fury, and the rebels have taken special care to destroy every piece of valuable equipment found on the stations they so viciously attacked. Rail tracks have been torn up; trains set on fire; wires cut and poles pulled down. This is part of their scheme to make us quit India. Government servants have been reported attacked, with stones; bottles; knives; daggers; spears; guns and anything else that the raving crowds can get their hands on. In some cases, kerosene has been used to burn terrified officials alive. Every torture that the mobs can devise, have been put into practise and they intend to stop at nothing. we have been really upset to hear that two R.A.F. officers travelling by train in Northern India were ordered to hand over their revolvers by a raving-mad mob. When they refused to do so, their carriage was immediately stoned and windows smashed ... the excited and insane mob waiting for 'the kill' .....eventually the officers were disarmed and murdered. 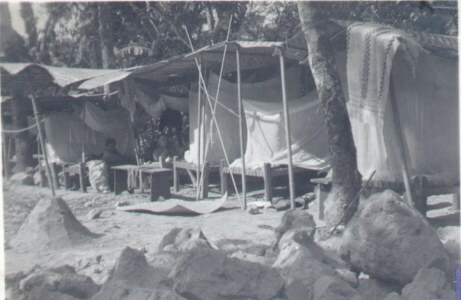 Apart from the awful hazzards of operational work over the unforgiving jungle in foul weather, against an enemy that took few prisoners, and the extra worry about political support flights, the squadron had its fair share of accidents plus the medical problems associated with living in the tropics under active service conditions. For instance on 25/08/1942 P/O Whiteside died from an abscess on his appendix. Three weeks later on 12/09/1942, Flt/Sgt. Ffolliett-Forte Foster (Tex) who, despite his name, was an American in the RAF, had 2 bombs fall from his aircraft Blenheim Z7985 and explode while he was taxying out at Argartala prior to a raid on Mandalay. He was badly hurt and his navigator F/Sgt (Darky) Taton was badly burned and later died of injuries. F/Sgt Foster was well known on the squadron as an expert pilot and daredevil, most thought highly of him but not surprisingly as with any who maintain a high profile, there were some who did not. Then on the 28/09/1942, two Blenheims bound for Argartala Z7369 and Z9749 piloted by Sgt Taylor and Sgt Wal McLellan were taking off abreast of each other and collided halfway down the runway at Asansol, both were destroyed by fire. Corp Glyn Edwards witnessed this crash: A miracle happened this afternoon, two of our Blenheims collided when taking off down the runway, and with both aircraft bursting into flames, both crews made a miraculous escape as bombs dropped off, and hundreds of rounds of ammunition exploded in the area. This was the first time that two planes had attempted to take off side by side, and following this expensive experiment, I should imagine that it will be the last ! Both aircraft are a complete 'write-off' but thank goodness the crews were only shaken and all in one piece. With everyone ducking and bullets going off around us, it was some considerable time, before the wreckage could be cleared from the runway. We've put it down to 'just another incident at Asansol' ! There were also some major personnel changes to the squadron this month as pilot Wal McLellan explains. "When we arrived back at Asansol, we were told that 45 was reforming at Yelehanka and all ex - 45 crews were to report there immediately. You can imagine how over-joyed we were, as our stay with 113 had not been a particularly happy one. On looking back, I did not do many Ops on the Blenheims in the India Burma theater due mainly to the lack of serviceable aircraft and there being lots of crews to fly what was there". September was a disasterous month for the squadron from every angle, and even mother nature got in on the destruction when on Sept 20th the area was hit by one of the worst storms on record: Today we are recovering from a cyclone which swept Bengal during the night. Asansol only suffered the tail-end of the storm, but even so, houses have been torn apart and flooded; part of our billet roof disappeared into the darkness; some of our aircraft broke their moorings and turned over, causing much damage, and a report has come in that approximately ten thousand natives in Bengal have perished. This morning our billet and beds were saturated, and the air turned bitter cold; natives swathed in blankets walked around in a daze, carrying cans of lighted charcoal in an effort to keep warm. The whole of Bengal is one big disaster area, although cyclones are not uncommon in this part of the country, and as our bearer said ... one day it will all happen again ! Despite the weather, the attacks against Japanese forces continued unabated right through 1942 in the face of strong opposition from ground fire, trip wires, and aggressive fighter aircraft. On 29th. October during an eight aircraft attack on Shwebo there was heavy anti-aircraft fire followed by an attack by 3 'Army 01' fighters (most probably the early name used to describe what became known as the Zero or perhaps the Oscar) which lasted for 23 minutes and resulted in one enemy aircraft shot down and another damaged with no loss of Blenheims, although there was some minor damage. "Concerning the 360 degree traverse of the turret, there is quite a story. The Squadron was on a raid down the Arakan coast and Gus Alder's gunner decided to test his guns in the forward position when the formation was near Feni. The gunner, an Aussie named Brooks, fired his guns which turned out to be out of line and some of the bullets found their way into the pilot's cabin, one of them glancing off the back of Gus' head. Gus hollered "I've been shot!" and his Obo, Corbett another Aussie, replied "who the hell shot you" Gus retorted "I don' t know but I am going to land this plane before I die !" 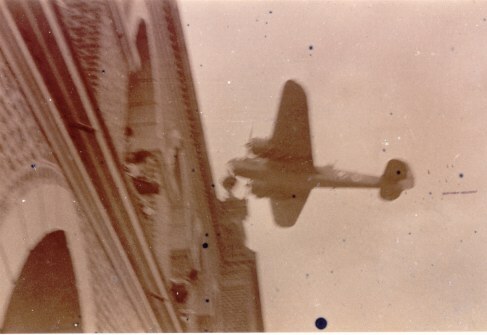 Meanwhile the gunner, who knew who had fired the shots but not that Gus had been hit was crawling up the well of the Blenheim and when he reached the peephole area to look into the cockpit, he found Corbett who had taken off Gus' helmet, poking his finger through the hole in the back of it and said "You shot Gus". Meanwhile Gus is fighting back the black nausea and wandering all over the sky. Unfortunately, Gus was the leader that day and we in the rest of the aircraft were trying to keep formation with Gus. He eventually made a crash landing at Feni, the aircraft being BA452. All, Gus had was a large sized headache and a small hole that required a few stitches to close. Gus related the story to me when he got back to the Squadron, which was located at Comilla and laughed heartily at the incident." One interesting change in personnel recorded on 20th. October was the departure on promotion of the squadron Intelligence Officer, F/O Bryer-Lloyd, who had been with the unit for a period of 20 months in the Western Desert, Greece, Crete, Burma and India, thus becoming one of the longest serving officers in the life of the squadron untill that time. He was followed shortly by W/Cdr. Walter whose replacement as C/O was, as recorded in the signal confirming the change, F/Lt. (Act. S/Ldr. ), (Act. W/Cdr.) Jones who was to be the last commander of the squadron in its bomber role. One of the last operations from Asansol on 12th. December was a big one when ten aircraft from 113 plus five from 60 squadron, escorted by no less than 21 Hurricanes bombed Mandalay without loss. Mandalay, Burma. 12 September 1942. 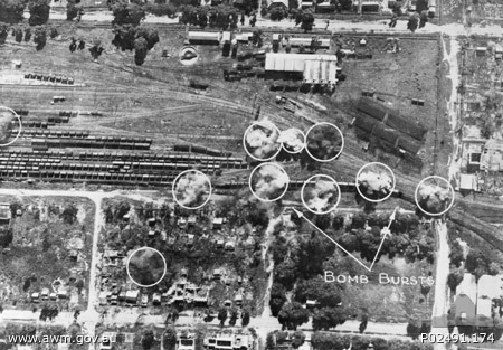 Bomb bursts, on the tracks and rolling stock in the south part of the train station, results of a successful attack by No. 60 (Hurricane) Squadron RAF and No. 113 (Hurricane) Squadron RAF of the Strategic Air Force, Eastern Air Command on the station and railway yards. NOTE: The above photo and caption from the Australia War Memorial Site ID Number: P02491.174 has both squadrons incorrectly listed as Hurricane, which of course should read Blenheim. The date also may be incorrect unless a similar raid was conducted again in December on the same day. Several raids were provided with escorts at this time, mostly Hurricanes, but there is occasional mention of the Curtis Mohawk, a rare aircraft in RAF use but undoubtedly a very welcome sight to the bomber crews.